This entry was posted on June 17, 2011 at 02:02	and is filed under Ahmed Mansoor Human Rights Dubai, Human Rights Activst UAE, Nasser bin Ghaith, Samer Muscati, United Arab Emirates, Unrest Middle East. 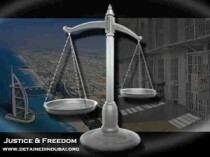 Tagged: Democracy Middle East, Human Rights UAE, Human Rights Watch, Nasser bin Ghaith. You can follow any responses to this entry through the RSS 2.0 feed. Both comments and pings are currently closed.